In order to support the artists you love and listen to on our service, please disable your ad blocker for this website. We believe in free access to music, but also a fair music industry where artists and others are paid for their work and services. Advertising allows us to deliver the best music to our listeners for free. JAZZRADIO.com is dedicated to safe and ethical advertising practices. Don't have an Ad Blocker? If you're using a private browser, VPN, or have tracking protection enabled it may be preventing ads from displaying properly. Please use a standard browser window with these features disabled to listen to our ad-supported radio, or upgrade to Premium for an ad-free listening experience. Eliminate ads completely with Premium! Keep your groove going with no commercial interruptions and enjoy all of your favorite channels without hearing or seeing advertisements. Listen to CD-Quality audio streams with JAZZRADIO.com Premium. That's twice the quality as the free options! Compare the sound quality and hear the difference for yourself. Premium allows you to stream channels using popular hardware players including Sonos, Squeezebox, Denon, Phillips, Pioneer, Roku, or and that support vTuner or TuneIn. You can also use audio players like iTunes, Winamp, VLC, and others. Premium works with our suite of native mobile apps for iOS, Android, and Kindle Fire. You can also access premium streams using almost any third-party hardware or software player of your choice. Access to our Entire Network! JAZZRADIO.com is now part of our network along with the following Internet Radio services - so your Premium Membership will work on their channels too! Explore over 95 channels of music from various genres including Pop, Relaxation, 60's, 70's, 80's, 90's, Latin, Rock, Urban, and more. Access the most extensive selection of electronic music available including trance, house, techno, dance, drum & bass, and so much more! Tune in and rock out to over 35 channels of rock music including soft rock, classic rock, metal, blues rock, and many more. Offering 50+ channels of curated classical music ranging from the Medieval Period to contemporary performances by todays brightest artists and composers. Thus far the best Jazz App I have found. Thank you, keep up the good work! JAZZRADIO.com has superior depth and variety... so glad I stumbled upon it! I have enjoyed your music very much over the years...keep it up! Best online jazz radio station ever!! One of the best features of Premium is being able to use it on RadioTunes.com and DI.FM too. So you pay nothing extra for an outstanding quality and enormous diversity! When you create a free account, you are allowed to stream at a respectable audio quality, but with commercial interruptions. 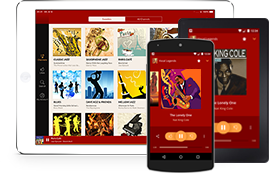 Premium offers even higher audio quality, commercial-free music, for a low monthly fee. Premium members are connected to preferential servers and receive access to our dedicated Premium support team. They are also allowed to access our steams on hardware players like Sonos and Squeezebox, and desktop players such as iTunes, VLC and many others. As a subscription service, we automatically bill your credit card or PayPal account depending on your subscription term. You will receive an email confirmation whenever a payment is made. Your subscription will automatically renew unless you set it otherwise in your account area. You can cancel at any time, for any reason, and you will not be billed again. Once cancelled, your Premium membership will remain active until it's expiration date. Which hardware players can I use with my premium Service? You can use any hardware player that accepts custom URLs. Here are some of the most common hardware players used by our Premium listeners: Sonos, Squeezebox, Denon, Phillips, Pioneer, Roku, or any players that support vTuner or TuneIn. Can I use my premium account in a commercial establishment?